SPRING TSD Times is HERE! Hot off the presses--our SPRING Edition of our Troy School District Newspaper arrived in homes across Troy this week. It's also available at all TSD schools, our Central Administration Building and many community locations, including the Library, Community Center and more. Here is a PDF copy you can read online as well! Three outstanding Troy School District teachers were surprised in their classrooms today with the news that they had been selected as Teachers of the Year out of 43 nominations received. The choice was VERY difficult, but the committee did a great job. Enroll Now! 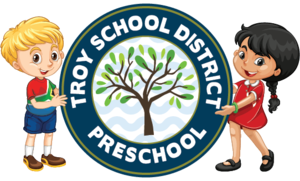 Our TSD Preschool Programs offer your child a high-quality, early learning experience that is literacy-rich and directly aligned to our K-12 Troy School District Curriculum. The Troy school District is implementing a new emergency protocol for crisis incidents. Four parent meetings were held to give information and ask questions. Knowing that not every parent was able to attend, here is the presentation given as well as a comprehensive list of FAQ and answers. Troy School District Boasts 54 National Merit Semifinalists! Fifty-four Troy School District students were named National Merit Semifinalists by the National Merit Scholarship Corporation. This honor is bestowed to less than one percent of students nationwide, based on their scores on the Preliminary SAT. About 1.5 million students take the PSAT every year. The Troy School District has partnered with Peachjar to send flyers advertising upcoming events to our school communities. All the info you need to know to get the word out is here!